Drawing from our Australian heritage, it’s with great pride we present the long anticipated Eucalyptus Bedding range. We chat with Founders, Emma and Victoria on how it all came about. What inspired the idea of working with Eucalyptus? Victoria - I came across some Eucalyptus textiles while doing a visit to one of our beautiful manufacturers. I asked them to tell me about the process and the material and I just fell in love. It’s such an amazing fibre to work with, with so many benefits for the earth and your sleep. Emma - Victoria and I loved designing this textile construction. It was exciting to work with Eucalyptus as it's one of Australia's many beautiful native botanicals. It's grown sustainably in an effort to tread a little lighter on this earth which is something that Victoria and I are passionate about. Our Eucalyptus sheets are so soft, silky and luxurious. We can't wait for you to try them! What makes The Beach People Eucalyptus different to others on the market? Victoria - Eucalyptus is often paired with polyester which to me doesn’t quite make sense. We really wanted to experiment with a 65/35 blend of Eucalyptus and Cotton, and we are so happy with the result. If you are searching for that perfect, "just woke up in a luxury resort" sheet... then this is for you. What effect does this have on the environment? Victoria - Eucalyptus, sometimes better known as Tencel Lyocell, is a fibre made from the wood pulp of trees that are grown and replaced on specialised tree farms. Unlike a lot of cellulosic fabrics, Eucalyptus (Tencel) is produced using recyclable and Earth-friendly solvents. There are no pesticides or irrigation used, and the production uses less land and water then cotton production. So you can rest easy knowing it's good for the earth too! What inspired the three colours? Emma - We were inspired by Australian Gum Trees and added our touch with these three colour ways. We like to refer to the colours as Light Oak, which is a beautiful light sandy colour, Ghost, the perfect white sheet, and Midnight Gum, a deep and rich charcoal tone. 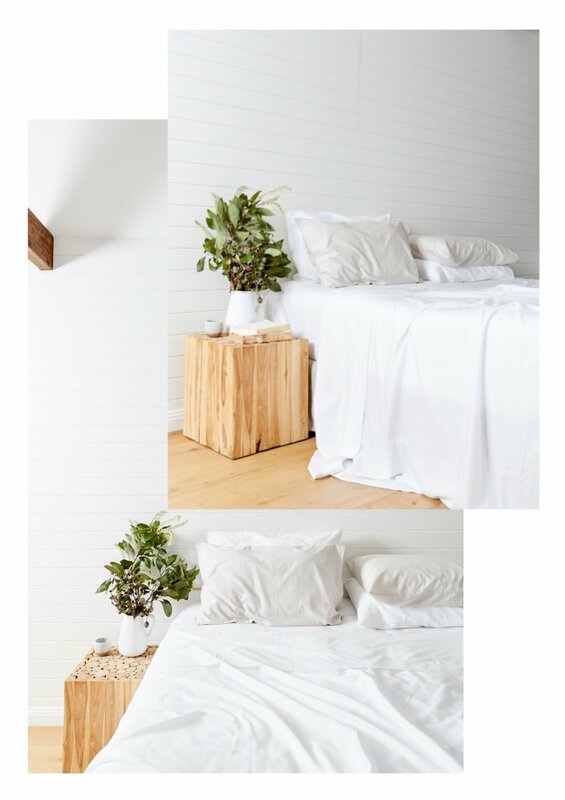 What are your top styling tips for the Eucalyptus Bedding? Emma - I feel like bedrooms should be tranquil, like you’ve escaped from the world into your sanctuary, so I usually style to reflect those feelings by adding natural wood, soft throws and dried or fresh blooms. Minimal and functional, with a touch of luxe. I love styling the Eucalyptus sheets with our Linen Duvet as the mix of textures are a dream. I'm loving the contrast of light and dark at the moment with the Eucalyptus sheets in Midnight Gum and the Linen Duvet in the Sky Blue, as they really complement each other. How are you going to be styling the bedding in your home? Victoria - I have a more masculine style bedroom as per the hubby’s request. I will be pairing the Eucalyptus sheets in Midnight Gum with my Linen Charcoal Duvet cover. It’s hilarious but my husband has a 2 pillow each rule on the master bed (he sounds like a grumpy old man I know!) so I have the Eucalyptus Pillowcases for sleeping on and the Linen Charcoal Pillowcases with feature ties for the top which adds an effortless and luxurious style to the bedroom… so easy to make and looks great! Does this Range require any special care? Victoria - Just like washing any other linen or cotton sheets, we prefer to use a natural eco laundry detergent, on a gentle wash, and then line dry them in the sun. The sun has antibacterial properties, so your laundry is sanitised naturally and hanging your white sheets in the sun actually makes them whiter! Read about how often we should be washing our sheets here. 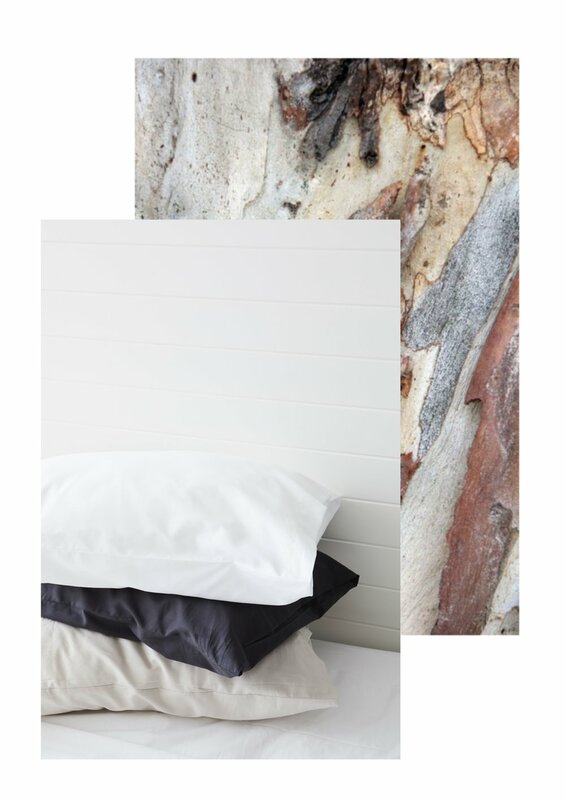 Our Eucalyptus bedding is available in three Australian Gum Tree inspired colours; Light Oak (Sand), Ghost (White) and Midnight Gum (Charcoal). Each sheet set is available in king, queen, double and single for the whole family. 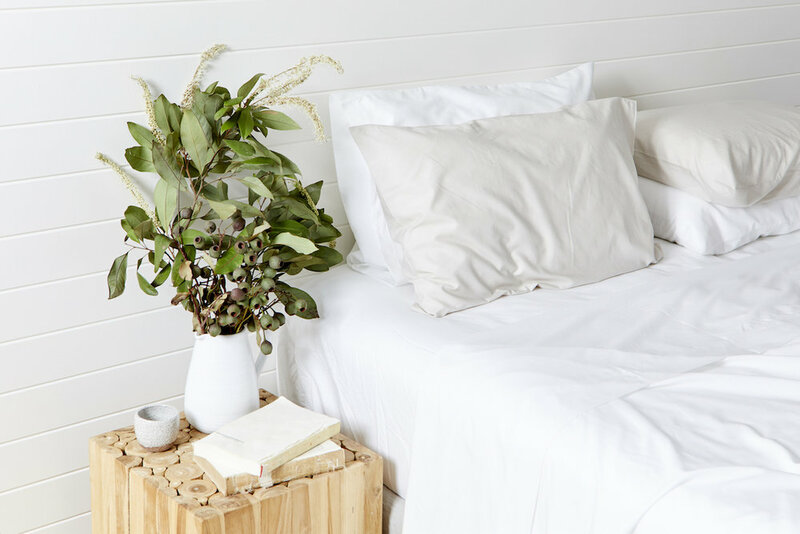 Shop the new luxurious Eucalyptus Bedding range below. 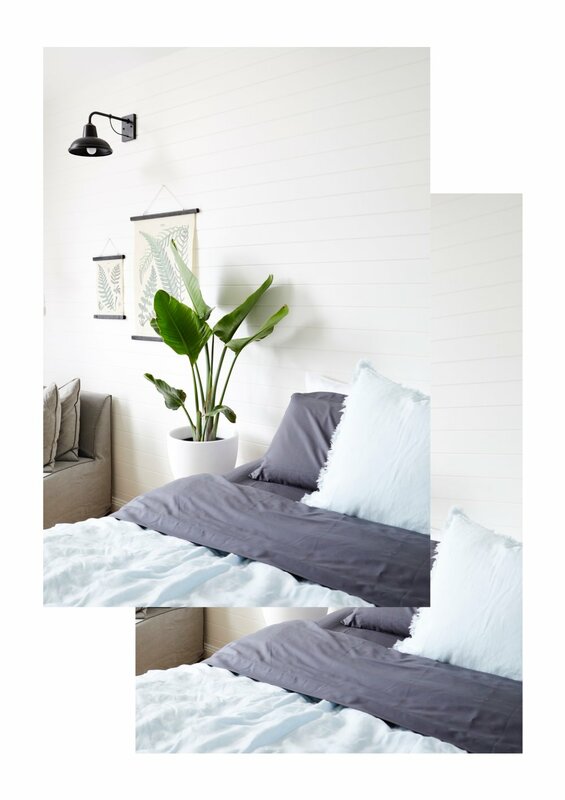 See how three interior stylists and creatives, Jason Grant, Christie Tyler and Austin and Alex style the Eucalyptus Sheets in their own homes in White, Sand and Charcoal.